We’re doing something different this year. Those of you who like to open presents early will be thrilled. It’s a Release Candidate, and it launches today. Download it and let us know what you think before the official release on March 1st. 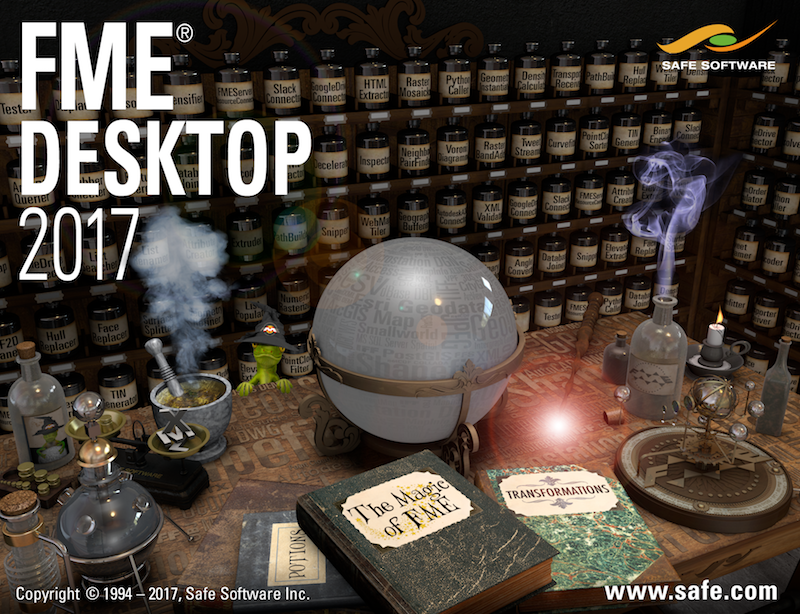 To see FME 2017.0 in action, sign up for the Deep Dive into FME Desktop 2017 (I’m co-hosting!) and Deep Dive into FME Server 2017 webinars happening in February. I also want to mention registration is open for the FME World Tour 2017. (I’m co-hosting that, too!) Check the agenda for the city nearest you and save your seat so you don’t miss the chance to hear inspiring stories and learn new skills from our experts. Here’s an overview of the updates we’re most excited about in the FME 2017.0 release. As usual, you’ll find overall better performance, ease-of-use, and more formats and transformers. See all changes, including bug fixes, performance enhancements, and specific upgrades, in the detailed docs: What’s Great in FME Desktop 2017.0, What’s Great in FME Server 2017.0. Typing on the canvas (“Quick Add”) gives you more than just transformers. Now you can add readers and writers this way, plus custom formats/transformers added by users in FME Hub. Transformer parameters are a dockable pane. It’s optional, but we think it’s better because you don’t have to double-click and open a new dialog. Toggle this under View > Windows. Choose between Curvy, Manhattan, or Classic connection line styles. Around here, we like Curvy best because it looks great and keeps everything clean. Manhattan lines are helpful if you have a very grid-like workspace. Toggle this under View > Cycle Connection Style. Write your data to a zip file. Tip: Anything after the .zip will be a subfolder, (e.g. C:/data/output.zip/mydata). For transformers that use an external file, right-click and choose Open Containing Folder (like you do with reader and writer feature types). For those that act as reader/writers, like FeatureReader and Joiner, you can also quickly Inspect. Choose what to do when features are rejected. 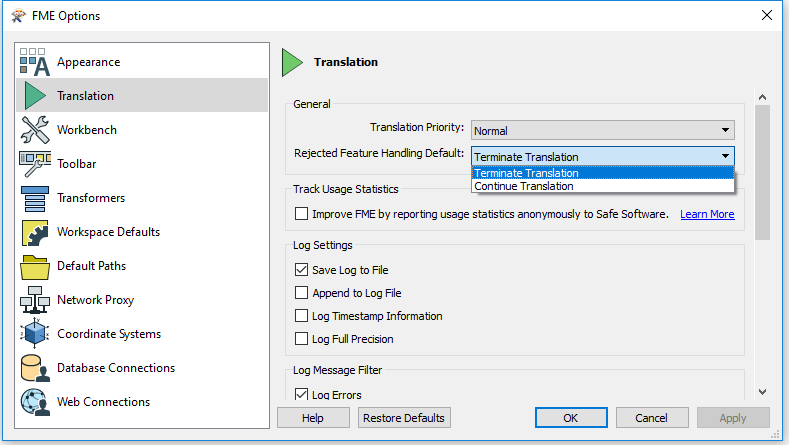 Under FME Options > Translation, set FME to either terminate or continue the translation. The default is to stop the translation. Copy and paste user parameters with a right-click in the Navigation Pane. It’s easier to inspect a particular subset of your schema in the FME Data Inspector table view. First, a pull-down menu lets you easily navigate between feature types. Second, choose exactly which columns you want to see and in which order. Work with dates and times using the new DateTimeCalculator transformer, plus new date/time functions in any place that has a text editor. Authenticate and save connection information for more web services (and databases, email accounts, FME Server instances) so you don’t need to re-enter it every time you want to connect to that service. Plus you can publish them up to FME Server. Browse remote data like a local filesystem — A360, Box, Dropbox, FME Server, Google Drive, and Microsoft OneDrive. MapInfo Extended TAB (reader) – for MapInfo’s new TAB files. You can also read old TAB files with it and in many cases it will be much faster. 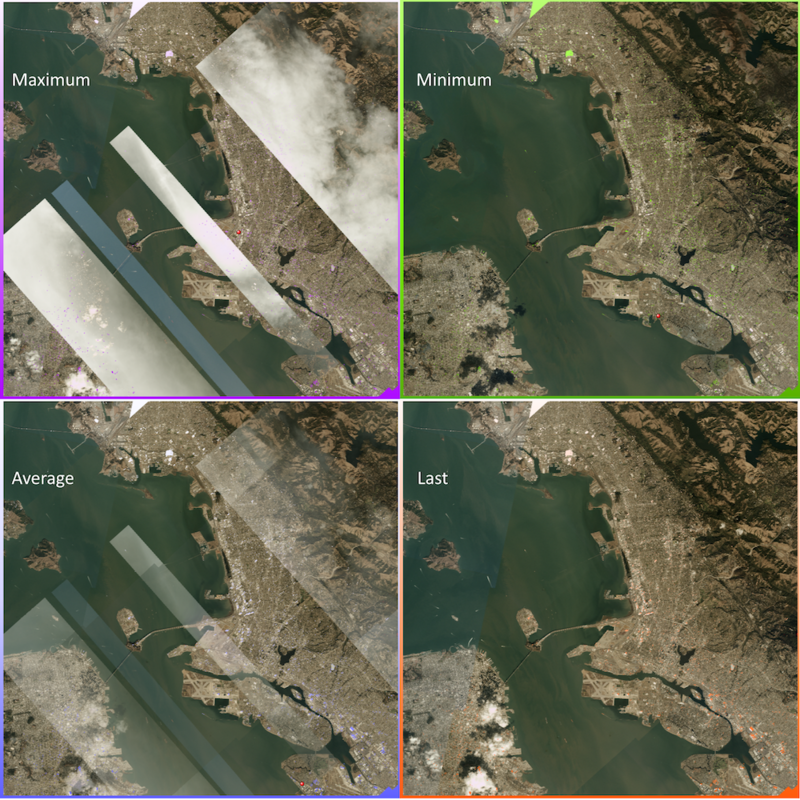 Sentinel-2 on AWS (reader) – plus look out for more satellite formats in upcoming releases. STL (reader/writer) – for 3D printing. RasterMosaicker – four modes to choose how overlap is handled when mosaicking. Choosing minimum mode is helpful for satellite imagery, because given a stack of images as input, it will output the darkest pixel — which means minimizing cloud coverage. 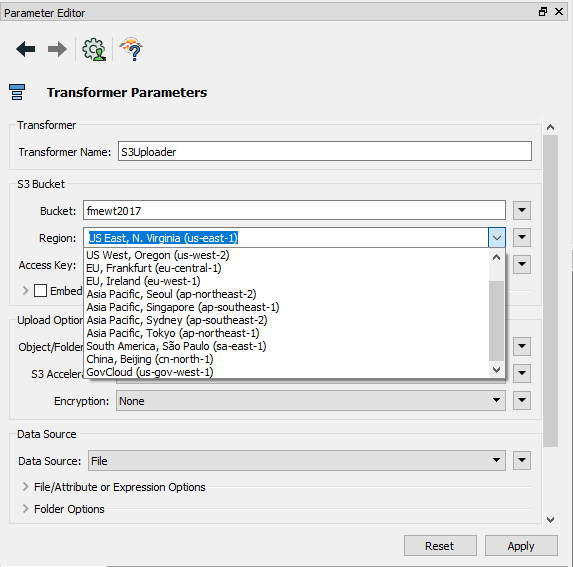 S3 transformers – more parameters to control reading and writing data. Choose which region you want (picking the closest region will give you the data quicker). Choosing accelerated mode will get you the data faster, but note Amazon will charge you more for this. GeometryValidator – tells you exactly where things went wrong with two new output ports, IssueLocations and InvalidParts. ShortestPathFinder – more options and better performance (learn more in Mark’s blog). 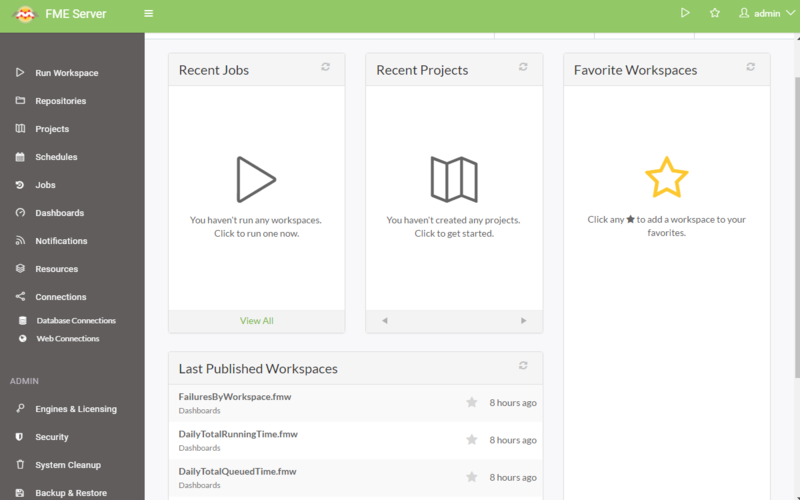 We’ve overhauled the interface. Just look at this thing. It’s beautiful. Everything is right there and easy to access on the left sidebar. An FME Server project is a group of resources (tasks, connections, repositories, schedules, topics, anything else you want to include) that you can export to share with other users and FME Server deployments. Projects make it easy to manage and share all components of FME Server, and are handy for migrating and backing up instances. User security options have been improved in several ways, giving users more control to set permissions on all FME Server components. We’ve also improved Active Directory integration so there is one unified security model across all your FME Server users. FME Cloud is cheaper. Boom. FME Hub is a growing collection of user-created transformers, formats, templates (i.e. workspace samples), and web connections. We encourage you to explore what’s available, submit your own work, and comment / star your favourites. You’ll see FME Hub transformers when you type on the canvas using Quick Add, and you can browse FME Hub directly in FME Workbench by clicking it in the Transformer Gallery pane. So those are the highlights for the FME 2017.0 release. We invite you to download the Release Candidate and be a beta tester over the next month. This is your official permission to break things — if you find any bugs or if anything isn’t working as it should, please tell us. And now I’m going back to working on some super excellent, top secret FME World Tour 2017 presentations. See you there! Hello, I see in your new release the MapInfo advances reader, do you plan to add the writer in the same release ? Thanks for your comment. An Extended MapInfo writer is planned for FME 2017.1, which should be released around the end of May. I am excited to work on this version. FME Hub is great, but the way it is stored in the cloud it cannot be accessed through a proxy server. It worked fine in 2014, but from 2015 onwards we have never been able to get to work with our proxy server. Hello, Is there any plan to implement the S-57 (ENC) Hydrographic Data format writer? Any updates to the TILER transformer? I read somewhere that the Tiler would be enhanced to add a ‘group by’ feature, so as to tile sets of similar geometries together and not the whole dataset.